Born into a family of painters, Guardi was a Venetian painter, celebrated for his Veduta works, or View painting, a genre of Landscapes. Domenico Guardi (1678 – 1716) passed on his artistry to his three sons, Francesco, Niccolò and Gian Antonio. As an individual artist, Francesco had not really gained his own reputation until the 20th century, as he was lumped together with his family’s workshop. The family’s work is often said to be the last true painters of the Venetian School in its classic form. Francesco Guardi received his full training starting in 1735 under Michele Marieschi, where he painted his first documented works in the Vigo di Fassa, a Trento municipality. While in Marieschi’s workshop, he also collaborated with his brother Gian Antonio, who headed the family studio. They painted religious works, such as a piece signed by Francesco, Saint Adoring the Eucarist. It was not until his brother’s death that Francesco focused on Veduta painting, though he did paint some prior landscape works. He was of course influenced by the other great Venetian Veduta painter of the day, Canaletto (1697 – 1768). He was also influenced by another Venetian Veduta painter, Luca Carlevaris (1663 – 1730), who may have been a teacher of Canaletto. As his style evolved, Guardi embraced a more free-handed approach to his cityscapes in comparison to Canaletto’s spatial detail. This gave Guardi a more atmospheric style that captured mood and an expressionistic view of Venice. This style was known as pittura di tocco, where he would lightly touch the canvas, with a small dotting motion and airy brushstrokes. Guardi’s works were not solely landscape pieces, having painted the Miracle of a Dominican Saint, for the church of San Pietro Martire in Murano. He is also well know for his 12 piece canvas of Doge’s Feasts in 1763 and then his 1779 piece in the Roncegno Church, Holy Trinity Appearing to Saints Peter and Paul. Between this period in his career, from 1765 to 1770, he painted his well know Veduta, The Lagoon Looking Towards Murano from the Fondamenta Nuove. He was commissioned in 1782 to paint canvases for the visit of Russian Archdukes to Venice. 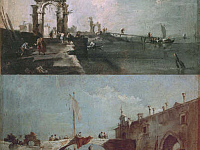 In much of his later works Guardi implored the sfumato technique for depth, exemplified by his piece Story of Tobit for the Church of Saint Raphael Angel in Venice. He also gave more emphasis in his colors with pieces such as Concerto of Eighty Orphans. In these last years of his life, Guardi is said to have painted his most personal and expressive works, which included his well know Lagoon views and capriccios. Of his Veduta paintings, the Seascape with Arch piece can be seen in the Uffizi Gallery. Guardi was admitted to the Art Academy of Venice in 1782.